Touchdown Bruins. Hundley to Evans. 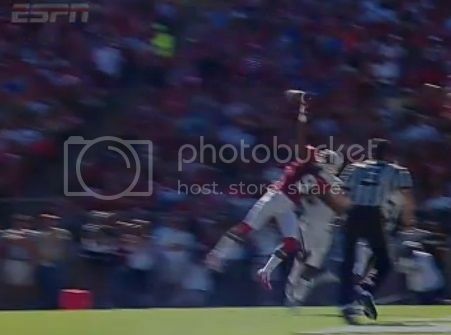 Here is a screen grab of Kodi Whitfield's one-handed TD catch. Play of the day right there. From that one, you can tell that pass interference or defensive holding should have been called. Tyler Gaffney now has 123 yards rushing for Stanford. You are right. If only the refs could use photos to correct their calls like they do replay. Ukropina's 46 yard FG try is long enough, but wide right. 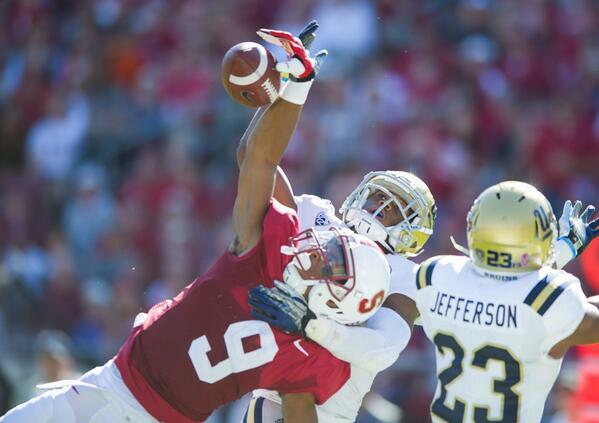 Jordan Richards with his second interception of the day gives Stanford the ball at the UCLA 32. I'm guessing Shaw is going to call a bunch of running plays. Good guess. That first down is pretty big. This first down was pretty huge. Touchdown Cardinal. Gaffney 4 yard run for his second touchdown run of the game. Ukropina adds the extra point. 1:42 left in the 4th quarter. Trent Murphy's sack ends the game for Stanford. Thanks to those who kept me company! New feature. The game ball goes to Tyler Gaffney, who ran the ball 36 times for 171 yards and 2 touchdowns. Thanks Angi. See you later!